WATCH: Check out the first teaser for Disney’s Descendants 2! The teenage children of Disney’s most evil villains are back in a brand new teaser for Disney’s Descendants 2. In Summer 2015, we were introduced to Malificent’s daughter Mal (Dove Cameron), the Evil Queen’s daughter Evie (Sofia Carson), Jafar’s son Jay (Booboo Stewart) and Cruella De Vil’s son Carlos (Cameron Boyce), four teenagers who discovered they weren’t as “rotten to the core” as their parents. That’s not to say they minded getting into trouble or singing catchy songs about being evil, however, because they absolutely didn’t. In the teaser, we get a glimpse of Cameron, Carson, Stewart and Boyce in the recording studio and practicing new dance moves. There’s also a behind-the-scenes look at those stunningly-detailed sets that depict the Isle of the Lost, the island where all Disney baddies are banished with their families. 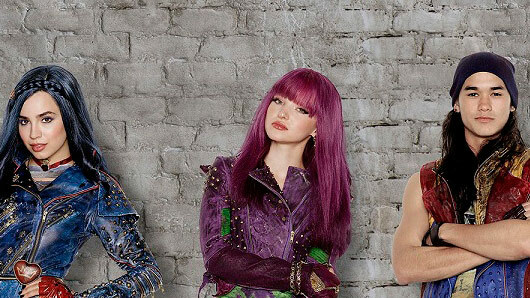 “Descendants 2, I can tell you without absolute utter confidence, this is going to blow the first one right out of the water,” promises Cameron in the promo. And there’s even a hint of what challenges these reformed mini-baddies might be facing back at home in the Isle of the Lost. It was recently announced that The Lodge star Thomas Doherty would be joining the cast of Descendants 2 as Harry, the son of Captain Hook. Could Harry lead the group into even more mischief? All we can say is this: Bring on Autumn 2017. Disney’s Descendants 2 will air on Disney Channel UK in Autumn 2017.